Now you can have a Bambi cookie jar made by Westland Giftware and it is adorable and really useful. 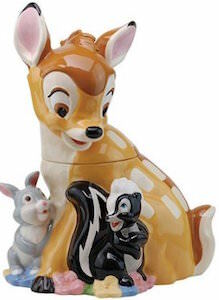 The cookie jar looks like Bambi with on the side her friends Flower and Thumper. If you have cookies lying around then now you can store them inside Bambi. Made from high-quality ceramics this cookie jar is one of those pieces that can be in your family for many generations as it is great quality and it looks fun. Of course, you like to eat your cookies but a Bambi cookie jar can help with saving a couple for later.